Alaine (pictured) and her friends Kelly and Jane were delighted to find out their tired kitchen was due to be replaced. Through the Planned Maintenance Programme they chose a shiny new one which was designed for Alaine to use in her wheelchair. Last year Katie, Elizabeth and Tessa decided to change support provider to Mencap. Through going to Mencap’s forum their friendship with Ruth and Kate has grown. GLH tenants, Paul and Alex learnt new skills while spending two days with Sean and Chris, our operatives carrying out a range of general repairs at tenants’ homes. Homemade cooking has become a real passion for Rob. He shares his story of combining his four favourite interests; cooking, listening to music, history and railways. Christian and his friends Gillian, Hazel, David and Robin had lived together for many years. Reduced mobility and changes to their personal care needs meant their Mencap home was no longer suitable. Welcome to the summer issue of Voices Together. Our easy read newsletter brings news from across Golden Lane Housing and tenant involvement. Raphaela and Glynn Derrick, Roma and Charles DeSilva, Margaret and Alan Summers, Mary and Garry Davies are parents of Cliona, Leanne, Christopher and Hugh who all have a learning disability and live together into a supported housing property. Best friends, Maria and Rachael share a place in the North West. Wanting to create a garden they could relax and enjoy, it was entered into the selection process for GLH’s annual tenant garden makeover. Earlier this week, Golden Lane Housing arranged an event in Rotherham for tenants to get know members of the GLH team and find out more about what they do. Andrew Locke, housing officer talks about the event. Friends Dan, James and Aaz live together in a bungalow bought using 2013 bond monies. He shares his great experiences of being a Mencap Young Ambassador which has also led to making new friends. 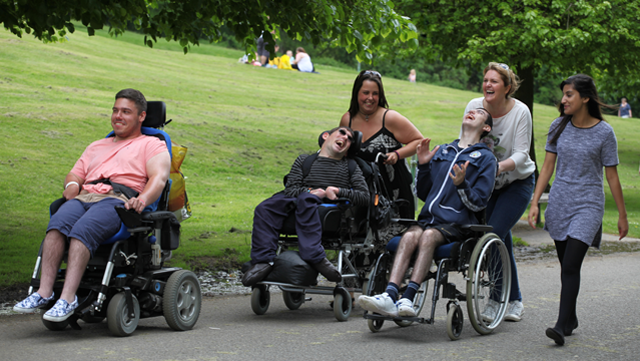 Dan, James and Aaz share a place together in Rochdale supported by Mencap. They moved into their home purchased using 2013 Bond monies which was adapted so they can move freely around in their wheelchairs. They explain how much they’re enjoying life.